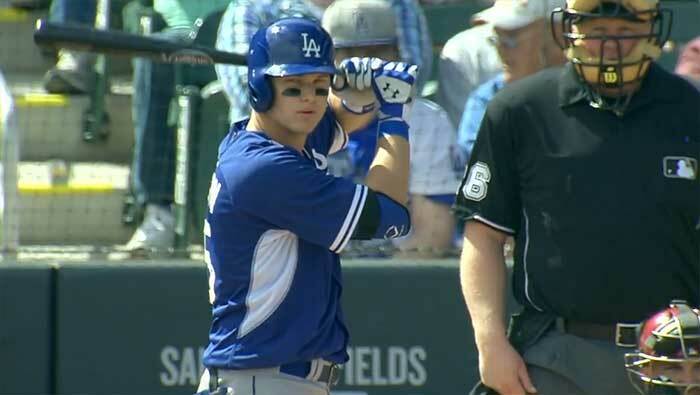 Today in Arizona, Joc Pederson did the second-best thing to taking a five-iron to Matt Kemp‘s ankle in terms of trying to make the team: he took Chicago’s Jake Petricka deep down the left field line ifor a home run in the seventh inning. Petricka’s not exactly Chris Sale or anything, but he is a noted groundballer who had allowed only 14 homers in 352.2 minor league innings, so taking him deep is an accomplishment. Pederson is still not very likely to make the Opening Day roster, but he’s not doing anything to diminish his prospect status… or his trade value. Either way, we’ve heard so much about him over the last four years since the Dodgers took him in the 11th round of the 2010 draft that it’s fun to see him live and in person — or on television, whatever — and doing the things we’ve all heard he’s capable of. I’m still not sure we’ll ever see him as a Dodger in the big leagues. For right now, I’m enjoying what I can get. That Pederson’s dinger accounted for the initial runs in a 5-0 win — Dee Gordon later scored in the eigthth (after stealing second) on a Mike Baxter hit, then Baxter scored on a Brendan Harris sac fly, then Baxter came in on a Clint Robinson dinger — means little, though the zero on the Chicago scoreboard means that the Dodgers pitched very well against what was more or less the White Sox’ regular lineup. Hyun-jin Ryu and relievers Brian Wilson, Kenley Jansen, Chris Perez, J.P. Howell, Jamey Wright, and Matt Magill blew through the Chicago offense with relative ease, and while it’s of course only Feb. 28, that deep, strong bullpen has a chance to be an enormous strength for the Dodgers this year. Also potentially a strength: Wright giving interviews, based on how he insisted to SNLA’s Alanna Rizzo that he was “feeling terrible,” with more than a little smirk. Also good: Alex Guerrero looked strong on defense, though he was 0-2 at the plate, fielding a few grounders and seamlessly turning a 6-4-3 DP. In other news, pitching prospect Ross Stripling is awaiting the results of his MRI. He’s already dropped the term “UCL”. He is, I am sad to say, just about certainly going to hear bad news. As always, pitching through arm pain never ever goes wrong.